Congratulations to the winners of PR Daily’s 2017 Digital PR & Social Media Awards! Our winners used social media and editorial assets to promote podcasts, using hashtags to encourage audience discussion across platforms. Video was the winning ingredient for a high takes zombie-themed mobile game that went viral. Exclusive content and a modern redesign led to big success for a health-related email marketing campaign. Partnerships in the art and crafting community led to an impressive increase in Instagram followers for an iconic art, craft and office supply brand. This year’s winners and honorable mentions thought creatively, delved deep into the needs of their audience and told their brands’ stories across popular digital and social channels. 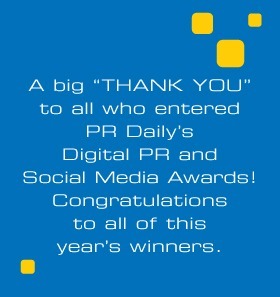 To everyone who entered PR Daily’s 2017 Digital PR & Social Media Awards, thank you for sharing with us! Women's Marketing: Blog, Women's Marketing Inc.
Digital PR Through Social Media, Workiva Inc.
Porter Novelli with HP Inc.
A Day in the Life of a Vdara Vdog, Vdara Hotel & Spa at ARIA Las Vegas with Internet Marketing Inc.